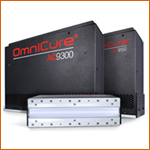 Consisting of the OmniCure AC9150, AC9150P, AC9225, AC9225P, AC9300 and AC9300P, the AC9 Series of UV LED curing systems have advanced front-end optics to provide the ideal combination of high power, high peak irradiance and exceptional uniformity at varying working distances. The three AC9-P versions of the AC9 series are equipped with a replaceable outer window for easier maintenance in printing applications at close working distances. A patented process for addressing individual UV LED module outputs provides exceptional uniformity for even curing over the entire area. The scalable design allows for multiple heads to be adjoined for customization and flexibility without compromising on output uniformity.